Mr. Shahrokh Zamani, a member of the Follow-Up Committee to Set Up Free Labour Organisations in Iran and the Painters’ Union of Tehran, is a popular and well-known labor activist who, through a letter written from prison in Tabriz, has asked us to help him have his voice heard internationally. Mr. Zamani was arrested on June 5, 2011 and was sentenced to 11 years in prison. His crime is defending the rights of workers and creating a union. As usual, they have not charged him with this but instead with trumped-up charges such as “propaganda against the regime” and the like. During his imprisonment, Mr. Zamani has been subjected to severe torture and cruelty. He is now being held in the notorious Rajaei-Shahr prison. Mr. Zamani’s letter is attached; by reading it, you will understand the details of his condition. 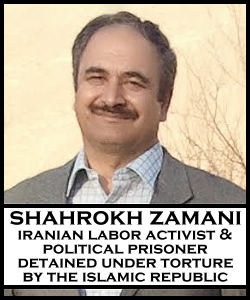 What is happening to Mr. Zamani is exactly what all other political prisoners and labor activists suffer. We ask you to help support Shahrokh Zamani in any manner you can. You can write to the Islamic Republic and protest the arrests, imprisonment and torture of labor activists and ask for the release of Mr. Zamani and other labor activists. While on this topic, we would like to add to Mr. Zamani’s the name of a few more activists. Mr. Reza Shahabi, Member of the Executive Board of the Union of Workers of Tehran and Suburbs United Bus Company; Mohammad Jarahi and Behnam Ebrahimzadeh, members of the Follow-Up Committee to Set Up Free Labour Organisations in Iran; Rasoul Bodaghi, member of the Teachers’ Trade Association; Abdolreza Ghanbari, a teacher who was arrested in 2009 and is in danger of receiving a death sentence; and many more labor activists, teacher activists and others involved in other social movements. Hear the sound of my plea! Tabriz prison is one of the most notorious prisons, known for its violent and murderous guards. The guards are infamous for their inhumane, murderous and unlawful ways. The prisoners have no rights such as furloughs, day passes and/or conditional releases. Even the borrowing of library books is completely under the control of prison officials who put the prisoners through a myriad of the absolute worse physical and psychological tortures. One of the worst of these tortures is the unleashing of the violent inmates (common criminals) upon the political prisoners. Since there are no rules, this is done on daily basis and there is not a day without some kind of an outbreak or problem between these two groups of prisoners. In one room, which is 20 meters, there are 21 beds and there are usually over forty prisoners in that room. There are always 7 violent common criminals amongst us to physically intimidate us and to spy on us. Political prisoners are put in close contact with those with AIDS and hepatitis which, along with the teasing of the guards, is most unnerving. In 2011, they transferred me from my cell – which, compared with where they were sending me, I now consider heavenly – to Section 12 of the Intelligence Office in order to torture me. This was a quarantined area reserved for dangerous criminals. This could only be tolerated for three days at most. Then, along with Mr. Jomhour Azgoch from P.K.K. (Kurdistan Workers Party), I was taken to Section 15, the Methadone Ward, to a room with 50 people who had AIDS and hepatitis. To protest this we went on hunger strike for days. So the officials inside the prison forced the common prisoners to lodge a complaint against me and a few others. They said we insulted the Leader, swore at the common criminal inmates, and encouraged other workers’ union prisoners to go on strike. This file was looked into, and consequently I was transferred to Rajaei Shahr Prison near Karaj. Despite my family’s complaints to legal institutions, including the Office of the Leader and the Supreme Court of Human Rights, I was still faced with intimidation and threats, and was still given no answers, only the run-around. I remember telling my lawyer about some of the threats from these institutions due to pressures put on my family. One Supreme Court expert said that sadly the charges against me were terribly unjust in that there was not the smallest of legal reasons for the judge to have given me such a sentence. One Islamic human rights person told my wife there was nothing that my wife could do regarding my situation at this point, as my sentencing had been determined by the higher-ups, and her only hope was contacting and referring my case to international human rights organizations. The judge who was forced to deliver my sentence based on three reasons/accusations said after the sentencing that he was just a subordinate in such complex matters and merely held a position of submission to the Leaders. The only hope we political prisoners have are the human rights organizations. Lastly I want to emphasize that the offices of the intelligence services have threatened my life both directly and indirectly: by poisoning; exposure to prisoners with AIDS; unleashing mentally ill, violent and dangerous inmates on me; and forcing prisoners around me to encourage me to escape so that I can be shot with a bullet while trying to escape. I have removed myself from such inmates after they were named and exposed. Some good, kind guards in the prison have given me a warning about this sort of thing and suggested that I use the example of Mr. Emani, an engineer; that it is no longer possible for the guards to help prisoners escape; and that I should be careful and watch myself regarding such suggestions and activities. So I am telling everyone, if I die in prison for any reason it is done by the officials. In hopes of a humane future, without discrimination and cruelty. I warmly shake your hands and thank you in advance for all your hard work. I thank you enormously.